Travel is an experience. It's about dreams and relationships. Daring, exploring, learning. Doing and not doing. Indulging and relaxing. Connecting, reconnecting. Travel is about being there. Active travelers, those who participate in travel activities, are a passionate subset who place high importance on travel. Travel is a key part of their life, and they take more trips and spend more on travel annually than the average leisure traveler. According to Phocuswright's newly published travel research report, Experiences 2019: U.S. Market Opportunity and Consumer Behavior, travel activities account for 8% of U.S. travel gross bookings and the segment comes in third by size behind hotels and flights. 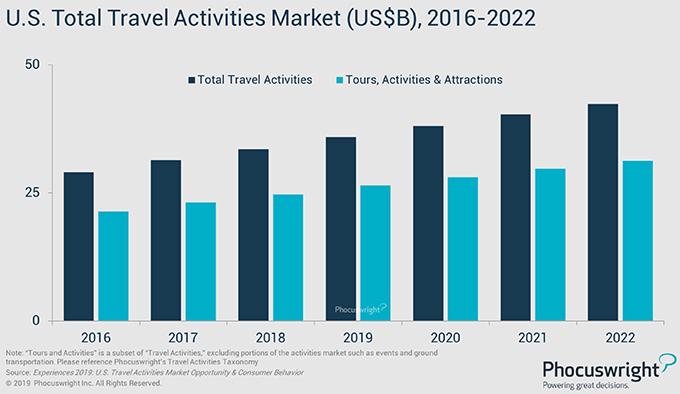 The U.S. travel activities market totaled $34 billion in 2018, and growth is outpacing the total travel market. Flights and accommodation can be a notable part of the travel experience if a traveler is in a front-of-plane seat or staying in a unique accommodation, but mostly these products serve as logistics. It's the things travelers do when they get there that inspire them to go places. Seven in 10 travelers consider activity options as an important factor when deciding on their destination, and more than one third start researching activities before they book any other trip elements. The industry has had to adapt business to realign to traveler behaviors, including what consumers hope to experience and how they behave throughout the activity decision-making process. Activity providers have gotten serious about digitizing business, making their inventory discoverable and bookable online - where most travelers prefer to research and purchase travel. The adoption of third-party reservation technology systems has contributed greatly to progress, providing a more efficient solution to manage business. Even though reservation technology adoption has been on the upswing, connectivity into online resellers, that is, connectivity into the platforms that aggregate activities for consumers to search and buy, is still largely manual. Moreover, many smaller business owners feel their enterprises are not of sufficient size to require technology to assist in their distribution. However, online activity resellers and reservation technology companies have spearheaded industry efforts to educate providers and champion the importance of digitization. More activity providers are getting the message and becoming connected and savvy. More ways than ever before enable travelers to discover and book things to do and fulfill their experiential aspirations.